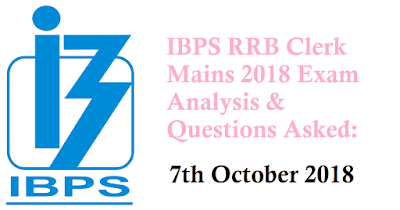 Dear Students, IBPS RRB Clerk Mains 2018 Online Examination is conducted today. 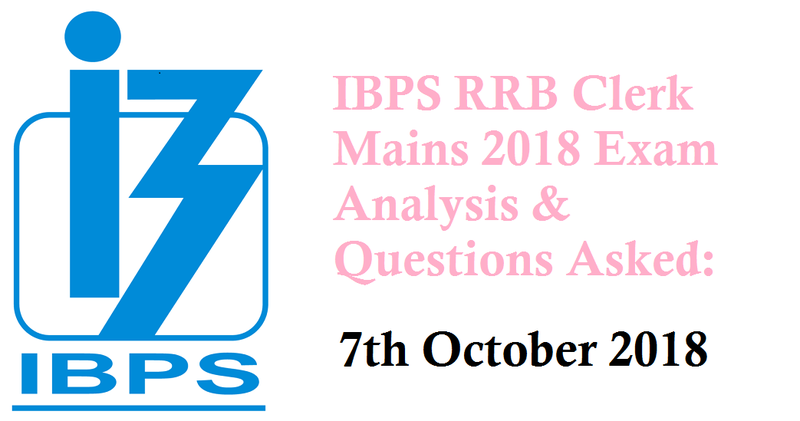 Now We are sharing IBPS RRB CLERK Mains Exam Analysis & Questions Asked. 1. Numerical Ability(40 Questions-50 Marks): In this section Word Problems were calculative, rest topics were doable within the time limit. Overall this section of easy to moderate level. 2. Reasoning(40 Questions-50 Marks):In this section Puzzles and seating Arrangement Problems were of moderate level, rest topics were doable within the time limit. Overall this section was of easy to moderate level. 3a. English Language(40 Questions-40 Marks):In this section Reading Comprehension and Cloze were of moderate level, rest topics were doable within the given time limit. Overall this section of easy to moderate level. Question. Rana Kapoor is the Managing Director and CEO of? Question. World Red Cross Day is celebrated on? Question. What is the currency of Denmark? Question. What is the GDP prediction of India by CSO in 2018-19? Question. Who is the present chairman of SEBI? Question. What is the full form of FAME India Scheme? Answer is: Faster Adoption and Manufacturing of (Hybrid &) Electric Vehicles in India. Question. Where is the Headquartered of World Bank? Answer is: Washington DC, USA. Question. The rate of interest charged by the central bank on the cash borrowed by commercial banks is called? Question. What is the current rate of SLR? Question. Where is the Headquartered of UNESCO? Question. The term "Back Heel" is related to? Question. What is the full form of DRDO? Question. Biplab Kumar Deb is the current Chief Minister of? Question. Who is the present Prime Minister of Canada? Question. 'Sashakt' plan to resolve NPA committee will be head by? Question.__________, Vijaya Bank and Dena Bank are to merge? Question. Dr. Harsh Vardhan is the incumbent minister at? Question. How many centuries in international cricket by Virat Kohli in Test Cricket? Question. The 2019 G20 summit will be the fourteenth meeting of Group of Twenty (G20) in? Question. Who is Bajrang Punia?